Infiniti sold a record 103,500 new vehicles around the world in the first half of 2015  a 13 per cent increase over the same period last year. On the back of a best-ever sales performance in 2014, Infiniti delivered another all-time-high result and for the first time sold more than 100,000 vehicles in the first six months. The brand also set records in China, Asia and EMEA (Europe, Middle East and Africa), as well as key individual markets including Canada, Mexico, South Africa, and Australia. Infiniti also achieved its best global June sales in its history by delivering more than 16,800 vehicles around the world, representing an increase of about 2,500 vehicles over June 2014. In fact, from September 2014 to June 2015, Infiniti has been on a streak of 10 consecutive best individual months on record. Roland Krueger, president of Infiniti Motor Company Limited, said: "Infiniti has been building a lot of momentum setting numerous global sales records in the past two years. This would not be possible without the trust and support from our dealer partners and our customers. We will continue to make strong progress towards our goal of becoming an established tier one global premium brand." 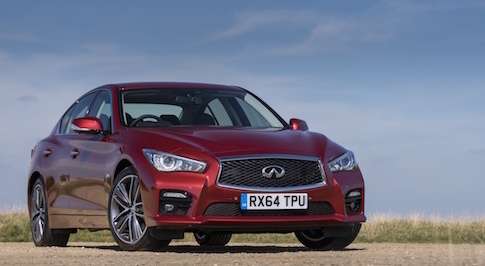 The sales growth has been spurred by a strong product offering led by the new Q50 sports saloon. Beyond Q50, Infiniti laid out plans to further expand its portfolio based on the much acclaimed concept cars that had been introduced during the last two years: Q30 Concept, Q60 Concept and QX30 Concept. The Q30 production version will be unveiled at the Frankfurt Auto Show in September this year and the car will go on sale in Europe towards the end of the year with other markets following shortly after. The Q30 will mark Infiniti's first-ever entry into the compact segment. Krueger added: "Infiniti has established a strong foundation in the first half of 2015. We enter the second half with great confidence. With powerful design and state-of-the-art technology, Infiniti has an excellent offering for our customers. We are well positioned to carry forward our current momentum."